Firstly, the video clip features "the best bits ever!" from the series (according to the uploader) and it should provide a few minutes worth of decent entertainment. Back in 1984, computer technology simply wasn't advanced enough to create a real computer-generated character. 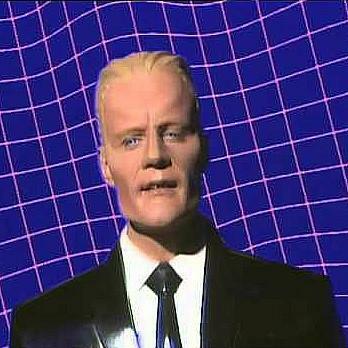 So the Canadian actor Matt Frewer had to endure a painful prosthetic make-up session for over four hours to play the part of the crazy Max Headroom. The actor has appeared in dozens of films, including the 2011 comedy drama 50/50 in his role as Mitch Barnett. 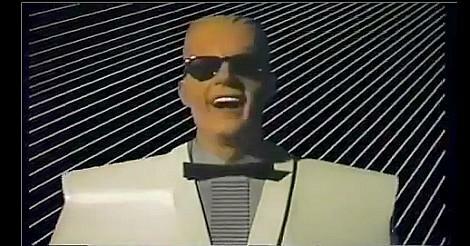 The Max Headroom Show was a music video show first shown in 1985 on Channel 4 in the UK. He was a pretty crazy character and even though Max himself wasn't computer-generated, the special effects were, and a Commodore Amiga was used to create them. There were six episodes in series one. There was a special guest in five of the six episodes and these were Sting, Simon Le Bon, Nick Rhodes, Roger Daltrey and Boy George. Series two introduced a studio audience and was a more professional affair. It also catered for an American TV audience and some of the guests invited on to the show reflected this. There were 10 episodes, plus a Christmas special during 1986. The guests were Michael Caine, Vidal Sassoon, Oliver Reed, Tracey Ullman, Rutger Haver, David Byrne, Howie Mandel, Jack Lemmon, Jackson Browne, Jackie Collins and Dave Edmunds. The Channel 4 programme schedulers made the mistake of moving series two to Friday nights, where it had to compete with the likes of Dallas and Miami Vice. Viewing figures collapsed and no more British shows were made. Shortly after the British show had finished, the TV drama series Max Headroom was created for U.S. TV. It was based on the TV movie Max Headroom: 20 Minutes Into The Future which was cretaed by Chrysalis and shown on Channel 4 in the UK during 1985. Cinemax aired highlights from the UK video show before airing the new drama series. 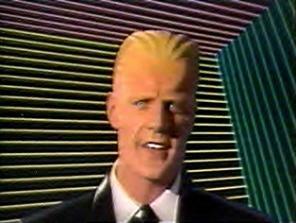 Max Headroom ran for two seasons on ABC between March 1987 and May 1988. Here we see the Irish broadcasting legend Sir Terry Wogan (he wasn't a Sir at the time, of course) interviewing Max on his chat show Wogan. The show ran from 1981 until 1992, when it was replaced by possibly the worst British soap in history, Eldorado.